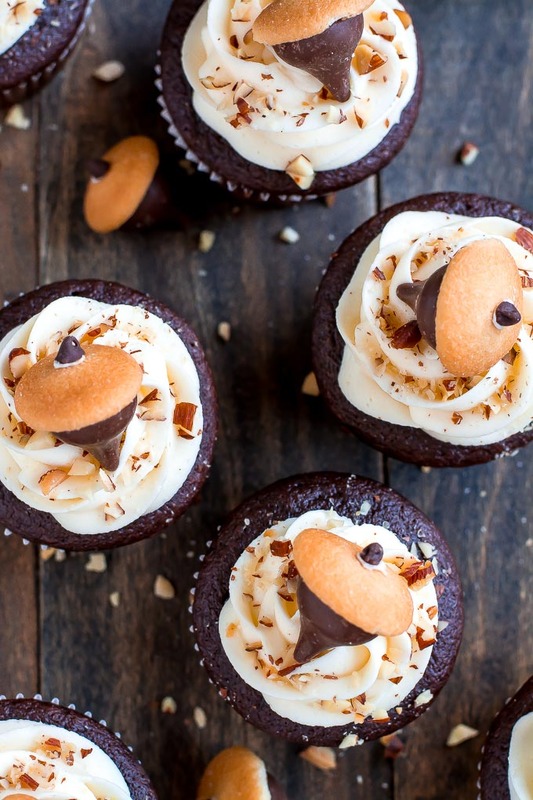 Celebrate Autumn with these cute Chocolate Almond Acorn Cupcakes topped with almond buttercream and an acorn made of a Vanilla Wafer and almond Kiss. I grew up where there are tons of beautiful green trees that in the fall give way to hundreds and hundreds of acorns. I’m talking squirrel heaven. We always had tons of squirrels running across our lawn and scurrying up the trees… and then there would be the occasional flat as a pancake one on the road. 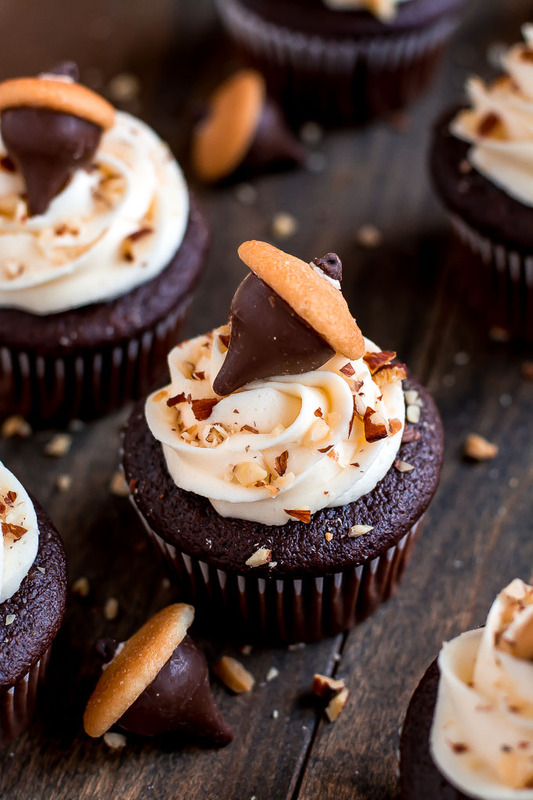 But I guess if real acorns tasted as good as these Chocolate Almond Acorn Cupcakes I might risk my life too. Well if you didn’t know, real acorns are way bitter but these chocolate and vanilla wafer acorn look a likes are super yummy! And aren’t they just too darn cute?!?! 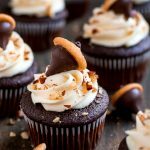 This is my favorite chocolate cupcake recipe that I used in these Raspberry Chocolate cupcakes (you really need to try that one if you haven’t yet). It’s moist and has such a tender crumb thanks to the sour cream, butter, and buttermilk. Plus it has the best chocolate flavor because it’s full of cocoa powder AND melted chocolate. It’s then topped with smooth vanilla-almond buttercream frosting. Pour 1/4 cup batter into each paper liner. Bake for 17-20 minutes or until toothpick comes out clean. Beat butter in an electric mixer until light and fluffy. Mix in extracts and salt. Add the sugar and begin mixing at a slow speed and gradually turn up the speed and cream 2-3 minutes. Using a toothpick, place a dot of the icing on the bottom of a mini chocolate chip and stick it on the top of a wafer and repeat with remaining chips and wafers. Dab the bottom of each Kiss with a little frosting and then stick it to the bottom of a wafer. While the cupcakes cool, make the acorns. Once the acorns are made use the remaining frosting to pipe onto each cupcakes. Top with an acorn and then sprinkle with chopped almonds. Oh Melanie, you always make the cutest cupcakes! Can’t wait to share these. They are adorable!!! 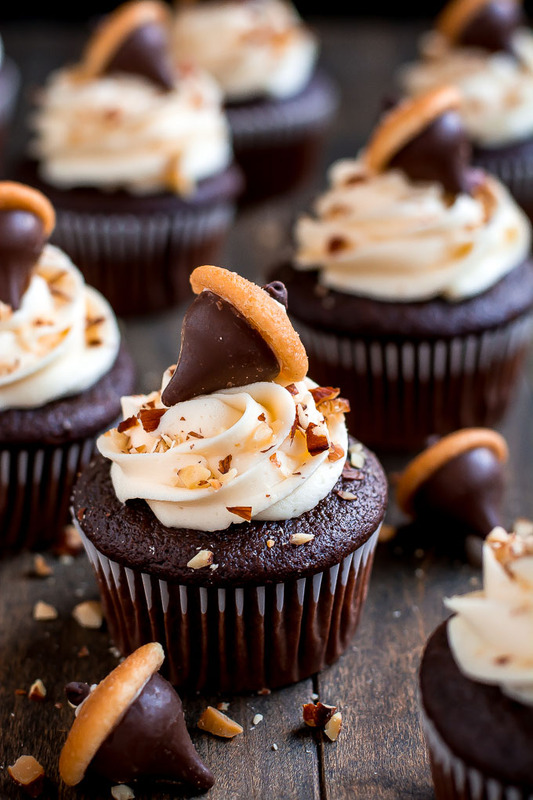 I’m not going to lie, I was a little thrown off when I read the title… Acorns in cupcakes? But OMG, these are SO IMPRESSIVE! I love the creativity and they look absolutely amazing! Thank you Margaret! Haha! Yeah, real acorns in cupcakes would be gross. These cupcakes are so cute! You did an awesome job! I love those little acorns. I just love the cuteness of them! Thanks Paige! Super cute, Melanie! Very creative!